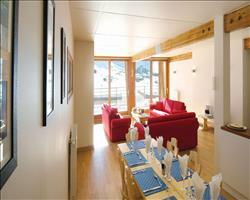 The modern Chalet Corniche was built three years ago and has a loyal following of returning guests each year. The communal areas are contemporary in style with a large central fireplace dividing the living and dining areas and the wellness area is a haven in which to unwind at the end of the day. The spacious bedrooms and two suites are all fitted with quality furnishings and are comfortable and well planned. The location of the Chalet Corniche could not be more ideal; it is literally just opposite the Marmottons children's ski slope and a mere minute from the Rosset chairlift and a further 30 seconds to the main Aeroski gondola. The Children's Snug on the first floor has a TV/DVD so please bring the children's favourite films. The room is also used for our evening Mini Cocoa Club. Rooms 3, 4, 5, 9 and 10 will take a cot. Rooms described as 'adjacent' are next door to one another, but not inter-connecting. The owner lives in an apartment on the third floor with shared stairwell access. 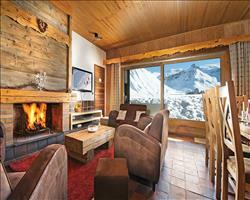 We update Chalet Corniche's details often, but facilities do change. e.g. some extras listed by the supplier as "free" or included might only be for the first time you use them, or for one time per party, then charged for further use. If any specific feature is essential to your holiday, make sure you ask us to confirm the details of it before you book your holiday. 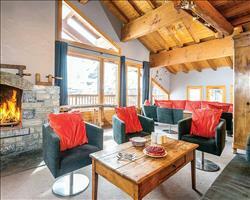 This package holiday to Chalet Corniche in Tignes, France departs Sunday 5th January 2020, for a 7 night stay on a "catered chalet" board basis. A local tourist tax (Taxe de Sejour or Kurtaxe) is levied by many councils in European ski resorts. It varies by standard and type of accommodation and is age dependent, so not everyone is charged. It's not included in the basic price of your holiday and is usually paid locally. For reference, the average charged in winter 15/16 was between 50p and £2 per person, per night. Tignes lift pass price last reported as €294 (adult 6 day). 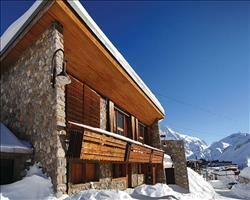 Ask for a quote when booking Chalet Corniche. This was our first ski chalet holiday. We have been very impressed. 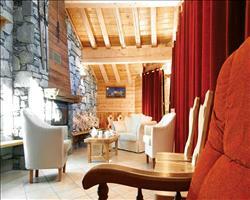 We would recommend chalet Corniche. One of the friendliest and relaxing holidays ever. 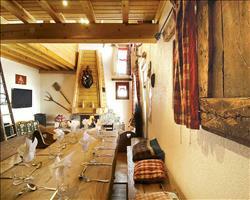 As a non-skier I enjoyed the stunning mountains, the well appointed chalet and good food. The staff are hard working & amiable. 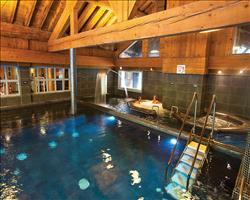 Tignes itself has plenty to offer - swimming pool, shops & supermarkets.